Most recently, Henna, Lawsonia alba, has been written in the press for its use in Mehendi art for the skin. Henna is also a wonderful natural hair conditioner. Cleopatra,'tis said, appreciated its benefits and added henna to her beauty arsenal. Many colors of henna are on the market. Neutral, Persian Red (my fav), Egyptian Red, Brown and Black are the most common. Blends of these five basic colors lead to shades like Chestnut, Mahogany, Strawberry and more. All henna has tones of red to it. The difference in the intensity of red color depends upon where and when the plant is grown and harvested. To use henna at home is very inexpensive, very easy and very good for your hair. Henna coats the hair with additional protein, giving it more body while seeming to repair damaged hair. Henna primarily is a color enhancer. It will provide highlights and bring out natural highlights without dramatically changing hair color. To be on the safe side test the effects on several underneath strands, before treating all your locks. This is powdered Persian Red Henna mixed with water to form a mud like paste. The paste is then applied to the hair. It is nice if you have a friend to help you apply the goop to your hair so that it can be done thoroughly and evenly. If you don't have a buddy just slap the henna paste on as best you can. Rub it in well. When you are done clean off any henna that may be on your forehead, ears, temples, sink, floor as henna is indeed a stain and will stain your skin for a couple of days. It is not a bad idea to wear gloves for the same reason. Allow the henna to remain on your hair for 35 minutes to two hours. The longer you leave it on the brighter the color and the longer it will last. Then rinse and wash. It takes a bit of rinsing to get the henna mud back out of your hair! This is the result of Henna on brown hair. In the sun the henna high lights really do shine. After a red Henna treatment above, Before Henna below. Both photos were take outside on relatively sunny days. For short hair use 2 to 3 oz of henna. For long hair like this use 6 oz of henna. Henna is a stain, not a dye and it will both wash out and grow out over a period of three months. If the desired effect is not achieved, distilled water and lemon juice mixed and used as a rinse will help strip the henna from hair, so you can start again. Of course The Rosemary House sells henna and is happy to help you learn how to use it! Vinegar hair rinses keep indefinitely so feel free to make a large batch. Vinegar rinses are good for itchy scalps, dandruff and dull hair. Surprisingly, vinegar is effective on both Oily and Dry Hair. It helps to restore the natural acidity of the scalp. 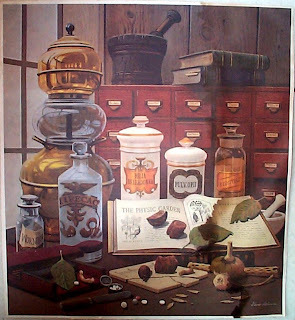 If the smell of vinegar bothers you, try it any way, I think you will find that the scent doesn't linger and that the essential oils help to lesson the smell of the vinegar. 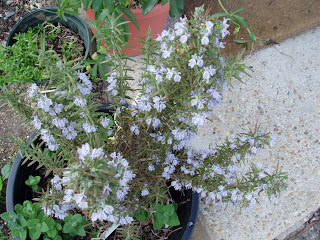 Fill an empty jar half full with Rosemary, Basil, Lavender and Peppermint, use either fresh or dried. Our favorite herb Rosemary has a reputation for promoting hair growth. Over the years we have sold many, many bottles of Rosemary Essential Oil which is massaged into the scalp or added to a bottle of shampoo to help hair to grow. It helps if your hair is thinning from age, stress or medications you may be on. The only time it doesn't work is if the hair follicles are not producing any more (in other words if your hubby is bald...rosemary won't do it). Some folks use a couple of drops of the oil massaged into their scalp before they go to bed at night and then wash in the morning. Others will add a 1 dram bottle of oil to a pint of shampoo and massage it in when they wash. Rosemary is one of the herbs richest in Anti-oxidents and I am sure that is part of its magical effect with hair growth. Peppermint is also a herb for the hair. I have read it will help hair to curl. We have lots of curls around here and peppermint does not get the credit. Peppermint is a great herb for those who have dry hair. It is also said to promote hair growth as well. Mix. This is a great way to stretch your shampoo and your budget plus it reduces the amount of detergent used on your hair keeping your locks healthier. 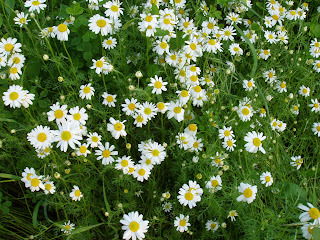 Using Chamomile as a rinse on your hair will help to keep it blond or give it golden highlights. You can also add in some Calendula as well. Simply simmer about 1 C of the herbs in with 2 quarts of water and use as a final rinse on your hair. Best if you can allow your hair to dry in the sun. Sage is the herb to keep your hair dark in color. In our area, the PA Germans are well known for their use of Sage. They simmer the Sage in an iron skillet and use it as a rinse on their hair. Personally, I think the iron skillet is as an important part of that recipe as the sage is.... Many recipes for maintaining dark hair also call for Black Walnut Hulls. They work very well and can stain most anything that come in their path...the bowl you simmer them up in....the sink... your skin. So when you work with the effective black walnut wear gloves, use an old pan and rinse outside. 1) COMPOST THEM but why? 2) Add the peels to vinegar to make an effective cleaning product. Simply add your citrus peels (just the peel, not the fruit) to apple cider vinegar. Let sit for at least two weeks to extract. Note: The primary chemical content in oranges in limonene which can safely be extracted in vinegar for home cleaning use. Limonene is a strong solvent, a byproduct of oranges, frequently used by industry as a degreaser. 3) Simmer in Water with cloves, cinnamon, that nasty old ground nutmeg you should get rid of and buy fresh whole nutmeg anyway to have your home space smelling fresh. 5) Grate and add to a white box cake mix to make a natural orange flavored cake. 6) Add to an 80 proof or above alcohol (vodka is fine) and tincture to use medicinally as a digestive bitter. It is carminative and will settle your stomach. application. Shake vigorously before each use. 8) Throw a few peels in with your rice. Yum! 9) Dry and add to pot pourri or to refresh your existing pot pourri they provide the most beautiful fragrance and color too. 10) Enjoy the organic orange peel in a cup of tea with Rose Hips, Hibiscus and maybe some Lemon Grass for a tea jam packed with Vitamin C and Flavonoids. Do you have any additional suggestions/ideas for orange peels? We'd be happy to hear them! We are participating in this third annual event, One World - One Heart, with bloggers from around the world. This contest is closed! 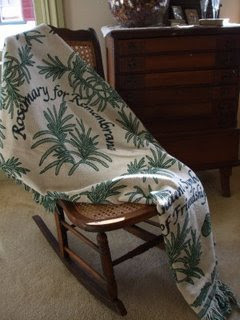 We will be offering a special Rosemary House Afghan featuring Rosemary, the herb of remembrance, and a cookbook from Sweet Remembrances as our giveaway. There are close to 600 bloggers (we're #581) participating in this unique world-wide event, be sure to visit them and enter their give-away also. When you enter our give-away; by leaving a comment on this post, please be sure to include an email address so we can contact you if you are the winner. The opportunity to enter this drawing has closed, thank you so much for participating! The winner will be announced on Feb. 12th. Good Luck! This little notecard and envelope, found recently at a local craft show, are crafted from wallpaper remnants. The card, cut in the shape of a tea pot, has a tea bag tucked in the center of it, and then has been adorned with a coordinating ribbon and sticker. A relatively simple little project for a cold wintry day. There's always room. . .
they have been doing the traditional mother-daughter things; but most recently, in 2004, they discovered their mutual passion for tea. Their Tea Journey is outlined in this cookbook that features 90 favorite family recipes, including appetizers (cheesy pimiento spread), soups (baked potato soup), scone, bread & muffins (praline-peach muffins), sandwiches (carrot-ginger tea sandwiches) cakes, bars, & cookies (strawberry ooey gooey butter cake), high tea and simple evening dinners, (garlic corn casserole). Oh my, deciding which one to try first is a dilemma, but a happy decision! Simply reading cookbooks is a pleasure for me, but actually preparing something from a new cookbook is a passion. We don't swing by Iowa too often, but a visit to Donna's tea room is definitely on my 'to-do' list! For now, owning their cookbook is the next best thing to being there! If you are interested in obtaining a copy of this little treasure, contact Donna . . . tell her Nancy sent you! National Pie Day - Today! It is National Pie Day! Although I enjoy pie, I don't make them too often. To be honest, my preference leans toward cake and icing, yes, lots of icing. However, these darling little lemon curd tartlets will start appearing on our tea tray in early Spring; but today, I'm simply enjoying thinking about my favorite Peanut Butter Pie... it's a winner, but one you can't indulge in too often! Do you have a favorite pie? Bake a pie, purchase a pie, share a pie with a friend, photograph a pie, draw a picture of a pie or dream of pie... anything goes today! recently for the 6th Picture Meme. Here are the rules to the photo meme: 6th Picture Meme! And here's our story, This picture was taken during our Fairy Festival, an annual event held the first weekend after Labor Day. Aren't those little fairy girls just too precious, enjoying tea in the garden? 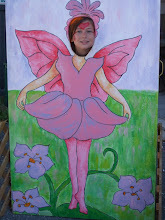 Tea and fairies abound at this fun event. We prepare Fairy Food Snack Sacks; and our favorite garden fairy, Fairy Rose Fairy tells stories and serves tiny cups of tea during her program. It is a fun and festive day for all. Thanks for playing! It doesn't matter how old we are, playing tag and attending fairy festivals is fun for all ages! A weekend visit to the eldest sister's home in New York included a train trip into NYC, on one of the coldest days of the month I might add. Walking briskly around the City, we added to the hustle and bustle as we took in the sights and sounds of this exciting destination. American Girl Place, Toys 'R Us, and the Empire State Building included a few of our stops. Last year we (Carrie, Angelica, and Nancy) enjoyed brunch at the American Girl Place. For lunch, we headed to Takashimaya, an upscale Japanese department store on Fifth Avenue (which unfortunately closed in 2010). Located on the lower level is The Tea Box, a simple yet elegant tea room where East meets West in a tranquil setting. Too early for their Afternoon Tea option, we ordered off the lunch menu. Carrie enjoyed the Bento Box, a wonderful assortment of unique treats, tofu, shrimp, salad, and rice; she enjoyed each bite skillfully using the chop sticks. My lunch featured a grilled sandwich stuffed with melted mozzarella cheese and sun dried tomatoes all accompanied with a delicately dressed salad and tasty vegetable chips. My sister, Carrie, a die-hard coffee drinker, has willingly attended tea rooms with me when we travel into the City. And, after several years, she has finally stopped announcing 'I don't like tea' and will share a pot with me; although, she always leaves the selection up to me. To start, I ordered a pot of the Takashimaya blend which is a nice traditional hearty tea, comprised of 3 black teas. She enjoyed it, or so she says. Deciding to push the envelope a bit, and broaden her horizons, I ordered a pot of Genmaicha, a Japanese Green tea with toasted rice and popped corn. Not her favorite; but I was happy to sample this tea. Definitely, a slightly nutty flavored tea with a distinct sea weed undertone. She tried it, afterall, it's a Japanese tea room, but she let me finish the pot! The black tea was served in the ceramic tea pot with a white mug with handles and a swizzle stick of crystallized sugar (which Angelica ate!). The Japanese green tea was served in the iron tea pot accompanied with the handleless cup shown in the photo. The lunch stop was indeed serene; a rather tranquil location to enjoy lunch and tea, and then it was back out into the bitter cold. Our day concluded with a mad dash, New York style, to catch the train home. We no sooner sat down on the seat when the train pulled out. Thanks Carrie and Phil for a very fun and memorable weekend excursion. 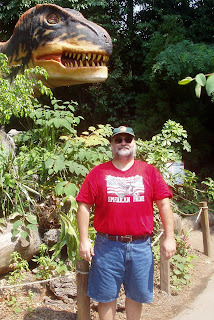 The last and the longest age of the Dinosaurs, The Cretaceous Period was the beginning of flowering plants. By the late Cretaceous hickories, oaks, and magnolias were well established. 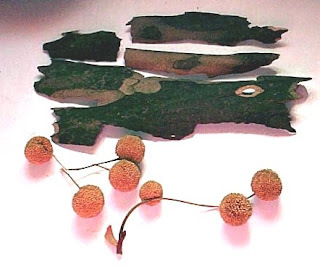 Fossil representatives of legumes, walnuts (pictured above) and sycamores (pictured below) have also been found in rocks. Sycamore, Platanus occidentalis, is a native American herbal tree. It is a tall and wonderful shade tree, distinguished by its peeling bark. Historically, sycamore bark was simmered and used to nourish the skin. 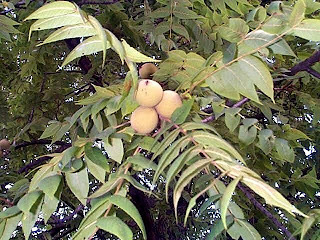 Black Walnut (Juglans nigra) is also an American native tree. 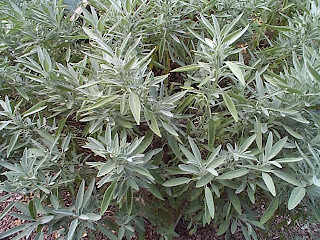 It is used as a strong black dye for wool or baskets. Black walnut is also a strong anti-fungal herb for athletes foot. Ah, it will dye your skin too. Black feet or itchy feet you pick. During the Triassic Period of no flowering plants, this ginkgo could be found growing inland on the dryer land. What is ginkgo good for again? Oh, that's right - memory... guess I should try some of that (just a little herbalist humor..). Ginkgo increases cerebral circulation and studies have shown that it can slow the progression of Alzheimers. You want to plant only the male ginkgo. The female plant produces the fruit and it is stinky. A hardy and adaptable plant not only can it survive the ice age but it is a wonderful street tree surviving exhaust fumes and excessive heat from macadam and cement. At the dawn of the age of Dinosaurs in the Triassic period (360 million years ago) the forests held ferns, club mosses, gymnosperms and Horsetails. No Flowering plants. I love to tell the children that visit our garden that the dinosaurs munched on these plants. 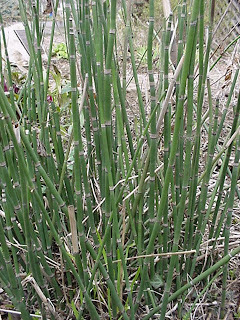 Horsetail, Equiseteum is often confused with cattails or bamboo. Horsetail tea is a mild diuretic. It is sometimes called scouring brush because it has a rough feel to it and was used to scrub pans. It has also been used as a fine finishing sandpaper by woodworkers. Rich in silica it is healthy for your hair and nails as well. This plant prefers a damp area on the edge of a pond or we planted it near our neighbors leaky downspout. Be forewarned: Once it is happy in your garden it will spread! And we don't have any dinosaurs to munch it down! Congratulations to Gwen, Linda, Julie, Denise, Roxanne, and Comfrey Cottages - you have each won a copy of Mary Mac's Tea Times Newsletter. Please contact me with your snail-mail address, and I'll put a newsletter in the mail to you! Thanks for participating! 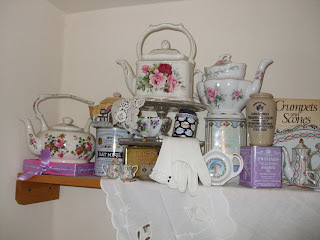 For La Tea Dah, Marilyn, Tina Sams, Martha and Lady Donna & Miss Spenser, IF you are interested, I discovered I have a few duplicate copies of The Tea House Times, a still-in-print bi-monthly newsletter that celebrates a 'Passion for tea, Victorian Treasures, and Friendship'. If you are interested in a copy of this newsletter, please contact me with your snail-mail address. Thanks to everyone that participated! We do appreciate your comments. Thank you for celebrating National Hot Tea Month with this fun blog-giveaway! Enjoy your newsletter over a cup of tea and share your thoughts with us! 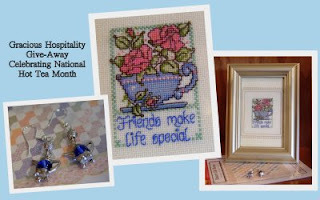 Also celebrating National Hot Tea Month is Gracious Hospitality, complete with a blog give-away that includes these items pictured. Her ongoing celebration of National Hot Tea Month has included some informative posts about tea and great pictures to accompany the posts. Be sure to visit La Donna, and leave a comment to be entered in her give-away. Let her know we sent you! Looks like fun to me! Mary Mac's TeaTimes Newsletter was one of the original subscription newsletters featuring afternoon tea. Available by mail, out of Washington state during the early to mid 1990's and billed as a continuing journey into the pleasures of afternoon tea, this little newsletter was full of afternoon tea ideas, menus, recipes, articles and advertising. Without the full color photography you find in Tea Time Magazine today, it was not nearly as glitzy or glamorous as this magazine. However, it was chock full of pertinent ideas and delicious recipes. The six different issues I have feature a Robert Burn's Birthday High Tea (a tribute to Scottish Poet Robert Burns), a Post-Holiday Light Tea and "I'll Diet Tomorrow" menu, Queen Victoria's Birthday High Tea, a Springtime Celebration Tea, and a Devonshire Cream Tea. For National Hot Tea Month, we have 6 past issues to distribute. Leave a comment on this post between now and Monday evening (1/12/09). We'll announce the winners on Tuesday morning, and we'll mail you a past issue of this 16-page now-out-of-print but still pertinent newsletter. My secret Santa placed tea-themed treasures under the tree for me. This do-dad laden wind chime, complete with teapot and cup will grace the old tree outside my kitchen window. It's always a special surprise when a new holiday teacup is unwrapped. The beautiful set is marked Lefton China, hand painted on the bottom of the cup. The shape is unusual, distinct from any I already have. This beautiful hand-painted box was a gift from a friend of my Mother's. A total surprise, and a family heirloom in the making, it now takes center stage on the mantel in the tea room. The small teapot sitting atop the box was also a gift from my nephew. Looks like everything has found its proper home... as if it has been here forever. Thank you to all my secret-Santas! I had a great secret-sister-Santa and it was a banner year for gifts for me. Three new herb books to spend January reading. Wild Jams & Jellies by Joe Freitus and Sally Haberman printed by Stackpole Books, featuring over 75 wild edibles and over 400 recipes on 320 pages. More than just jellies, it has mustard, vinegar, and oil recipes. Spiced Sea Grape Butter anyone? or Wild Onion Relish? Maybe I'll start with Sumac jelly. Figs, Dates, Laurel and Myrrh: Plants of the Bible and the Quran, by Lytton John Musselman printed by Timber Press, 335 pages. Gorgeous color photos, the plants are listed in alphabetical order, well indexed by Bible or Quran verse and by Latin and common names, and easy to read for anyone interested in the plants of the Bible (not just for Botanists). I am loving and learning from this book. See Inside Fairyland by Susanna Davidson, published by EDC company, 15 thick and busy pages. This lift the flap and peek gem of a book explores various areas Fairyland from The Frost Fair to Lily Pad Lake, it is all here. What did you want to peek into? The Rainbow Waterfall or The Goblin Market. These are just a few of the treasures. Silver bangles, herbal pottery and a few more Santas were also added to my collection. Thank you, Thank you to all my Santas! It was a Merry Christmas! National Hot Tea Month. Perfect! Enjoy the health benefits found in a cup of tea, feel the warmth of the tea in the pot, and as you wrap your hands around the mug (or cup) delight in the fragrance of the steaming hot brew. Ah, find comfort from a soothing, calming cup of tea - all month long. Don't limit yourself to just this month though! Visit Wordle to create your own word collage.